If you aren’t aware of it, the Royboys have quite a historical display on show at Docklands Stadium. Been there since 2011, thanks to the efforts of the Fitzroy-Brisbane Lions Historical Society. Any Roylover seeing it for the first time is just about guaranteed to find the goosebumps rising and running across their body. 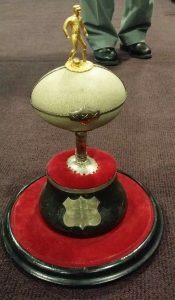 Amongst Bernie’s golden boots, Bulldog’s back-brace, Bunton’s trophies and a hundred and one other bits of Royboy history, sits an 1896 premiership trophy. Or it did until recently. It’s gone now, hoisted out rather unceremoniously last week. Huh? Turns out this bit of silverware was a ring-in. After sitting rather uncomfortably amongst the real lore and glory of the club for several years, I’m now in possession of it. All thanks to Arthur Wilson. Arthur Wilson’s one of the mainstays behind the Historical Society. Arthur’s a lifelong Fitzroy supporter and was the club’s Recruiting and Football Manager for many years, indeed he was the main brains behind the clever recruiting the club undertook in the late 1970s and ‘80’s. Think Pert, Roos, Osborne, Gale, Lynch et al. These days Arthur occupies himself with lawn bowls and Historical Society activities. 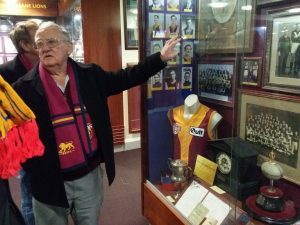 In June his forty plus years of work with both Fitzroy and the Brisbane Lions were rewarded when he was made a member of the Fitzroy – Brisbane Lions Hall of Fame. 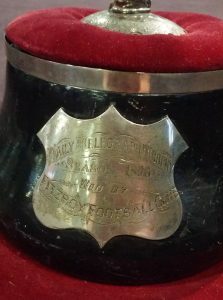 A couple of months ago Arthur contacted me about this 1896 trophy, explaining it had been handed to the Historical Society years ago by someone from Tasmania who wanted to make sure Fitzroy got all its ‘rightful’ property back. Knowing I live in Tasmania and have a passion for all things Roy, Arthur asked if I could do a bit of research to see what I could find out about this mysterious bit of silverware. It didn’t take me long – after an hour poking about on ‘Trove’, the wonderful local online newspaper resource, I unravelled the story of the Fitzroy side from Launceston who won the the local 1896 premiership. And were handed an ornate trophy by the local paper, the ‘Daily Telegraph’, for their efforts. These local Royboys – wearing ‘red and blue’ – only played for four years; other than a few references in local newspapers of the time, this trophy seems to be the only remaining keepsake of their short existence. Last weekend Arthur invited me and a couple of my mates to Docklands to catch the Lions in action against the Dons. After the match we were given our very own personal tour of the museum. At the end, and to my complete surprise and amazement, Arthur presented me with the trophy to take back home with me to Tassie. So now it’s here with me in Hobart. I intend to take it north soon, over the Boag’s – Cascade Line and back to Launceston, where I hope it will eventually find a home in the local museum. Go Roys – anywhere, anytime! Beautiful trophy, they don’t make ’em like that anymore. So is there a suburb in Launceston named Fitzroy? They certainly don’t make them like this anymore, Earl. Silver leaf, silver plate, gold plate, velvet cushions, possibly a Blackwood base, an emu egg as pseudo-footy. Dave, there’s no Fitzroy suburb in Launceston. It’s unclear why the team called themselves Fitzroy? Perhaps there was an affiliation with the Melbourne team, an ex-player or similar? The club colours hint at that – they’re described as wearing ‘red’ and blue, and red could possibly have been mistaken for maroon, or perhaps the colouration back then wasn’t quite as chemically fixed as it is on today’s materials? I hope to find out a little more when I contact the Queen Vic Museum and Art Gallery in Launceston soon.